Background: Death toll due to tuberculosis is still rising day by day. Whole genome sequence of Mycobacterium tuberculosis has provided a platform to conduct research in order to identify the probable drug target. Objectives: Out of 4000 gene products of M. tuberculosis, approximately 40% of proteins are annotated as hypothetical. Identifying and characterizing these proteins could provide a new prescriptive for developing new TB drugs. Rv1288, a protein of M. tuberculosis H37Rv has been annotated as a hypothetical protein in database. Attempt has been made to assign a meaningful role to rv1288 gene product in M. tuberculosis life cycle. Methods: A homology 3D structure of both domains was separately generated and assigned as Rv1288LytE and Rv1288est. Molecular simulation of Rv1288est was carried out for proper structure analysis. To further confirm the predictive role of Rv1288 in mycobacterium life cycle, molecular docking was performed. N-acetyl glucosamine, a major constituent of cell wall was docked with LytE domain, whereas, esterase domain was docked with lipolytic substrate, pNP-ester derivatives and inhibitors THL/PMSF. 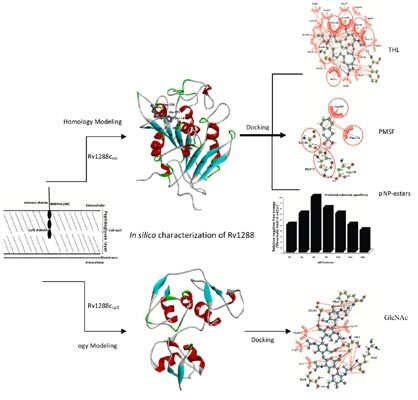 Results: In-silico analysis revealed that Rv1288 is a two domain protein, an N-terminal LytE domain containing three consecutive LysM motifs and a C-terminal esterase domain of esterase D family. LytE domain has the property to bind N-acetyl glucosamine moieties of peptidoglycan, a major component of cell wall. Detailed in-silico sequence analysis revealed that this LytE domain may help in positioning the esterase domain to the cell wall of mycobacterium. Esterase domain comprised a tetrapeptide motif HGGG, a pentapeptide sequence motif GxSxG and conserved amino acid residues Ser-141, Asp-238 and His-272 which constitute a catalytic triad characteristic of other hormone sensitive lipases/ esterases. Docking studies suggested that THL and PMSF could be the potent inhibitors for Rv1288 protein. Conclusion: In the present investigation, we bioinformatically confirmed that Rv1288 is most likely a LytE domain containing lipolytic enzyme showing similarity to hormone sensitive lipases/esterases. Keywords: Esterase, LysM motifs, LytE domain, Mycobacterium tuberculosis, N-acetyl glucosamine, peptidoglycan, Rv1288, THL. Keywords:Esterase, LysM motifs, LytE domain, Mycobacterium tuberculosis, N-acetyl glucosamine, peptidoglycan, Rv1288, THL. Abstract:Background: Death toll due to tuberculosis is still rising day by day. Whole genome sequence of Mycobacterium tuberculosis has provided a platform to conduct research in order to identify the probable drug target. XDR-TB, What is it; How is it Treated; and why is Therapeutic Failure so High?